Christmas is a time for shimmering and glittering and the return of the dark smokey eye. 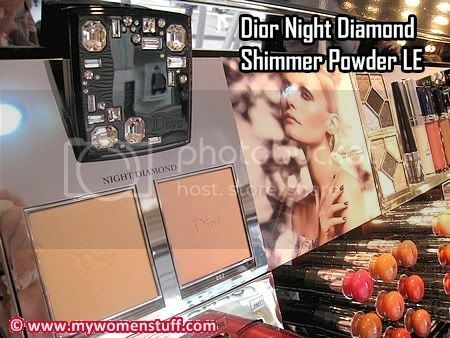 For Christmas 2008 Dior’s offering is Night Diamond – a collection of limited edition products that wink and shimmer and glitter away at you. I saw the products yesterday at the launch of the Dior Iconic mascara and I had to test them out. 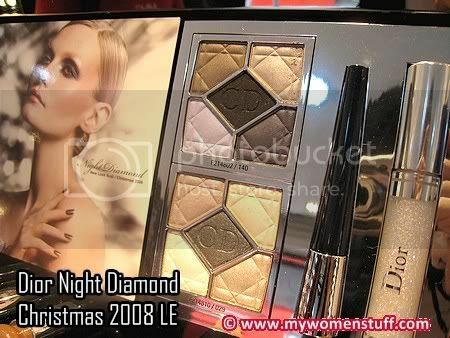 So, once the crowd had dissipated around the Dior makeup truck (more on that below – I’d like to hear your thoughts) I went to play with Dior’s Christmas 2008 collection – Night Diamond. First up, the Dior Night Diamond Eyeshadow palettes (RM187). 2 Limited Edition eyeshadow palettes in the Iridescent eyeshadow quint named – Twilight and Moonlight respectively. Twilight is the one with the darker shades while Moonlight is the one with the light shades. At first sight, I was interested in Twilight the one with the darker shades. The colours are iridescent and very strong in colour. The middle colour is really dark and glittery which some people may like and some may not. It is definitely a smokey eye palette. Moonlight on the other hand is rather strange. There are 4 light shades with one dark shade in the middle. The light shades are iridescent and lovely on their own. However, worn together, they look way too similar to justify putting all of them in one palette. Also, I thought the middle shade stood out too much so careful blending is required when using Moonlight. Here are some swatches on the back of my hand. 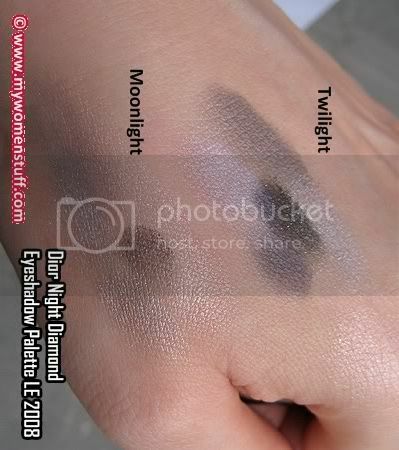 You can see that Twilight is dark and pigmented while Moonlight barely shows up. However, I’d say that if you are very pale skinned then you may be able to pull off Moonlight for a pretty ethereal look. The other Limited Edition item in the Night Diamond collection is the All Over Diamond Dust shimmer powder. There are 2 shades – beige and pink. Beige has slight golden tones and would be lovely on those with tanned skin while pink has erm… pink tones and gives a light fresh look. Both products look like pressed powder in the pan, but swiped on, there is noticable shimmer. I was told it acts as a highlighter and I can see how. However, I’m going to say that its a little too shimmery for the day. Perfect for the night, but not so much for the day. Still, it felt and looked nice and it comes in a limited edition case with a lucite “diamond” studded cover. (Aside: I was absolutely captivated by that model who I found lovely in a very ethereal way, rather like Arwen in Lord of the Rings… LOL) Anyway, about the truck. It has a full Dior makeup counter on the back of a lorry so people can climb up and play around, but I’ll be honest – I felt it was strange. I’ve always associated Dior with luxury and beautifully scented beauty halls in nice cool department stores. When I want to test the products, I want to do so in relative cool comfort with a patient (or maybe impatient) sales assistant helping me as I go along to make an informed purchase. After all, Dior does not come cheap and lets face it, its not a brand for the masses. Its a brand that you want to approach with slight trepedition and be blown away by the sheer awesomeness of the products so you end up handing over your plastic at the cashier without a second thought (and weeping over your credit card statement at the end of the month). That for me is the Dior shopping experience. Not in the back of a hot truck crowding around a makeup counter with 50 other women trying to grab that tester of that one shade of lipstick you have been eyeing from the back of their heads. I don’t know, that’s me. What do you think of this innovative idea by Dior? Take the poll below and have a great weekend! wow you’re fast! 🙂 I haven’t even downloaded my pics yet! I’d have to agree with you on the truck – having a 1-ton lorry all in black albeit with the interior done up like a glam makeup counter is still that – a 1-ton lorry. The mascara test was fun though! Hmm… me no likey the truck thingy. Dior is such an exclusive and luxurious brand. Trucks for drugstore brands would be cool but not Dior. The model is pretty though! It was nice meeting you that day,Paris! really glad to finally meet you. haha Yeah I have to admit the truck thing is a rather bold move for Dior. Twilight doth entices, but RM187 is quite a bit to fork out for a palette. Even if it is Dior. Sigh… Not that it’s stopping me from going “I waaaaaaantt!! !” though. The truck thingy makes Dior looks a little cheap. They should’ve just kept to their classy image. If the people wants Dior, they’d still come to the store. With the proper ambience..
@beetrice : Heh… I had to get it off my chest. The Christmas stuff caught my eye though after you left. @Connie : Yes the black in Twilight looks gorgeous but as a palette, its very similar to any number of smokey eye palettes that get released about this time. @geekchic:I have to agree. 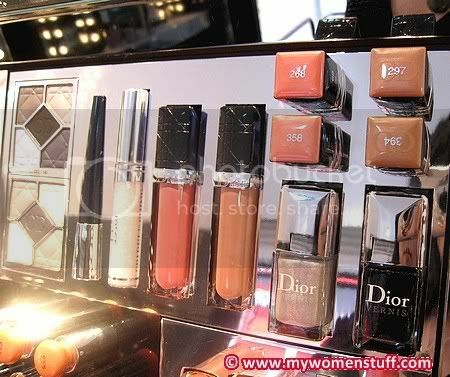 The whole Dior collection is pretty but nothing awesome. Still, you did well with a pair of birks! @Syen : I agree about the truck. Somehow it makes the brand look cheap which at RM187 a palette it isn’t! @Lizzie: I think most of us will think the same – test it but balk at the price. That said, at RM187 for 5 colours you aren’t doing too badly. I’m liking the e/s palettes, but a little weirded out by the truck concept. Somehow or other it makes me think of the Milo truck at school? I just updated the review on Moonlight. OK, I think the first picture of your review has the wrong lighting as the colours are WAY OFF! Twilight is supposed to be BLUE and BLACk and Moonlight is supposed to be gray and whitish. Glad you did swatches as they look better. I will put up the review on Twilight soon. That is a better quint. I wish I had a chance to attend such fun event. the model is cute indeed. by the way, moonlight does show its different colours on the back of your hand. they are all washed out on me. i will not crawl up to a truck to try mascara. NUTS! Twilight looks pretty, and yes, that model is so fabulous! I didn’t know Dior uses a runaway truck for this. LOL. @Sue : Its something new for them and yes Twilight is nice for a smokey look.